LEGO Minifigure gift tags from DK Books. DK books posted free LEGO Minifigure gifts tag you can print and use to address your gifts. Visit DK US to print these tags featuring Santa, The Toy solider, Clockwork robot, and Santa Yoda from the 2011 Advent Calendar. DK book publishes all those the great LEGO books. Enjoy this Christmas bonus from them. 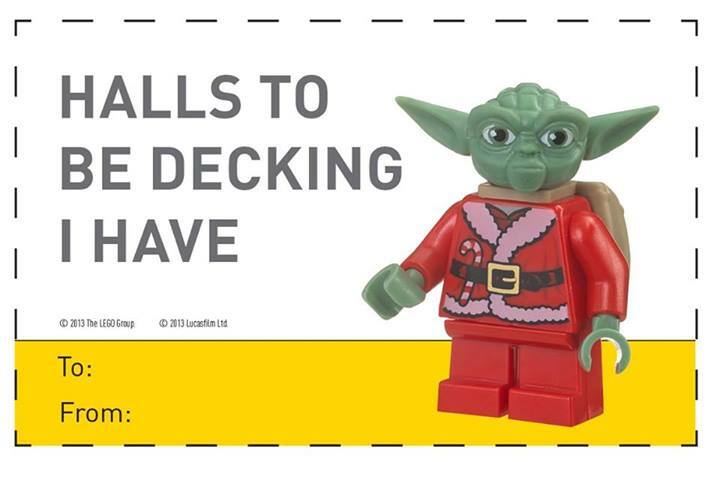 December 23, 2013 | Categories: LEGO, Star Wars, Yoda | Tags: #9509, (lego Yoda), 7958, DK books, free, LEGO, lego advent calendar, LEGO books, LEGO Minifigure, mini-figs, Santa Yoda | Comments Off on LEGO Minifigure gift tags from DK Books. It’s cold outside, what do you mean you have to pee? We a dusting of snow, preceded by freezing rain. Usually when we get snow it melts away pretty fast. Luckily I had time to create a few mini-figs in snow pics. 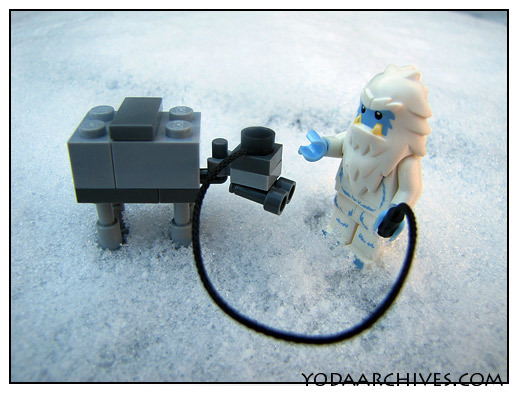 Yeti is from series 11 collectible mini figures and the AT-AT is from 2012 Star Wars Advent calendar (9509). A quick review of the 2012 Star Wars Advent Calendar. My favorites were the AT-AT, Rebel Trooper(ANH), R2D2 and Santa Darth Maul. Least favorite was the MTT. The weapons should have been packed with the figures. A couple of ships were hard to id. Plus too much Phantom Menace builds for me. But overall another fun advent calendar. I hope LEGO makes another one next year. What Christmas theme minifig would you like to see in 2013? I like to see Queen Amidala from set #9499 Gungan Sub as a Christmas tree. Next year Hasbro packing features Yoda. Will the calendar be focused on Return of the Jedi for the 30th anniversary? or on one of the prequels that will be out in 3D next fall? December 23rd star wars advent build is R2-D2 snow droid! December 20 Star Wars advent build is General Grievous’ ship, the Soulless One.